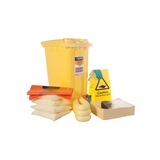 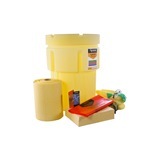 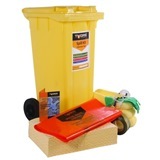 Tygris 1000 Litre Chemical Spill Kit is a high capacity spill kit for chemical spills, enclosed within a durable and portable wheelie bin with a drop front for easy access, making it perfect for storage and for easy movement to a spill site. 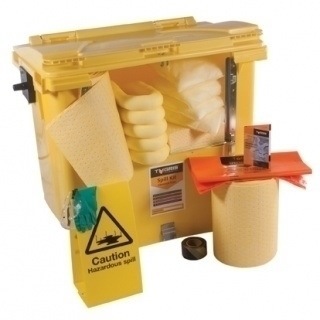 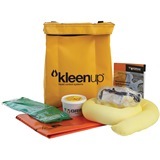 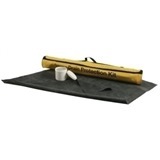 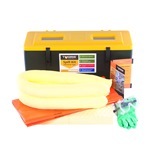 The kit contains essential equipment for the initial containment of absorbents that require immediate disposal after a spill, including 650 absorbent mats, 20 absorbent cushions, waste bags, and barrier tape. 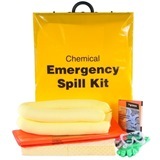 As well as materials for absorption, the 1000 Litre Chemical Spill Kit comes with protective clothing for two people, with a pair of gloves, goggles and a pair of coveralls included.